I came across interesting data last week : Americans consume more than two times more oil per capita than Europeans. As we will see, this can be explained by three factors. Bringing oil consumption per capita to European levels would enable the USA to be independent from foreign oil, save a lot of money, create millions of jobs, prevent massive climate change and preserve the environment. Luckily President Obama’s administration is working on increasing both the mileage of vehicles and the use of high speed rail to overcome the current economic downturn. America’s addiction to oil is not new, nor are the solutions. What is new is the political will to tackle the issue with concrete measures. Below is a table showing the oil consumption per capita of major countries. Please note that the average European Union consumption is similar to the French and German. It is worth noting is that if Indians were to consume as much oil per capita than Americans, they would need 80 millions barrels per day. This is totally impossible as the current global production is of 85 million barrels and that there are much doubts this figure will increase significantly in the years to come. The United States are a large oil producers ( 8.5 million barrels per day) when Europe isn’t. This led to less stringent mileage requirements and bigger cars. The second factor is the lack of high speed trains. Germany, Spain, Italy and France have such trains. Convenient and affordable, they are great alternatives to both cars and planes. The third factor is taxes. 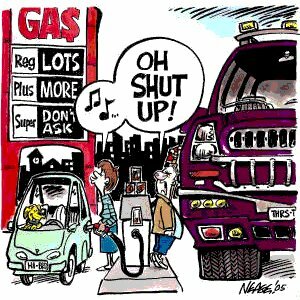 Gasoline is much more taxed in Europe that it is in America. I remember reading last year that Bill Richardson wanted cars to get 50 MPG by 2020. Recently more voices added to this opinion. An article on Ecogeek brings more reflection on this issue. If European cars can get 47 MPG by 2012, I am sure American cars could get 50 MPG by 2015. This would be good for US carmakers. Indeed, if Ford or GM bring to the European market a super efficient car I am sure they would be able to sell them. The president’s announcement included an outline of 10 corridors around the US that will each likely see rail begin construction. So buckle up. (…) With only $8 billion specifically allotted to getting the project off the ground, and an additional $1 billion a year for five years, he’s going to have to be cautious of where he builds rail. And he seems to have acknowledged this in his planning—instead of an ambitious plan to lay rail from coast to coast, Obama is suggesting 10 corridors of 100-600 miles each around the country. Check out Obama’s vision for high speed rail in America for yourself below–the grey lines are where future lines will hopefully go. Blue is where high speed rail already exists (yup, it’s that single, solitary line in the Northeast—we’re way behind Japan and Europe here). 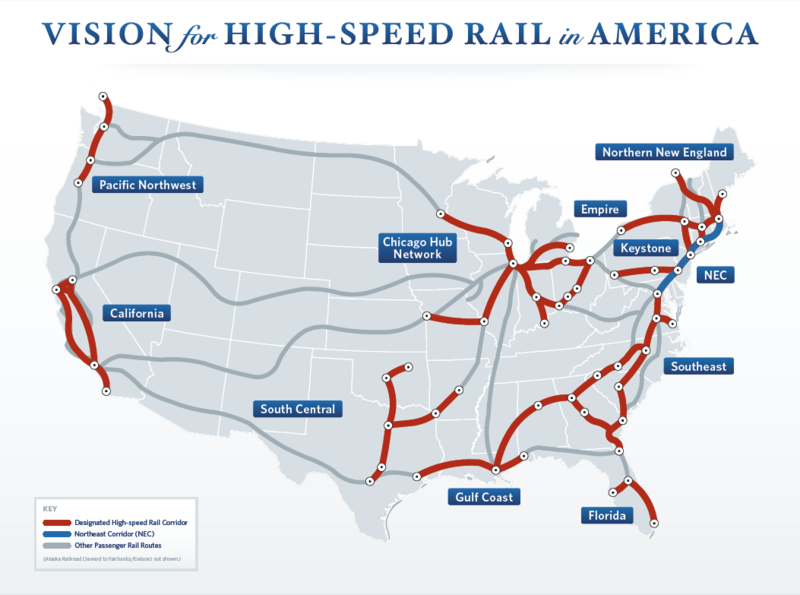 So all in all, the plan looks like a solid first step–and it could very well mean that we finally see a high speed rail system emerge in the US in coming years. I think Obama’s suffering from the same curse all political leaders have: the attraction to the Big Shiny Project. Sometimes the things we need to do don’t cost billions of dollars or require the highest technology. I don’t think high speed trains are really needed by the US. They already have a substantial railway network, but it’s quite neglected and run-down. If your old bicycle had worn-out tyres, would you buy an entirely new and much more expensive bicycle, or just get the old one some new tyres? If the US is unable to maintain a low-speed train network, how will it maintain a high-speed one? In any case, the bulk of private consumption of fuel comes not from interstate journeys such as high speed rail is good for, but much more mundane stuff like driving to work, the shops, recreation, etc. What the Americans need to do – I know, because it’s what Australians need to do, too – is to revive their old rail, have more buses, more cycling paths, improve zoning laws so that commerce, industry and residential areas can be close to each-other instead of far apart, and so on. I mean, many US suburbs don’t even have pavements for people to walk on! There’s just the road, and then a house’s driveway. Being able to go from New York to LA by rail in three hours doesn’t address these problems. The second main consumer of oil in the USA is their road freight. And again, this is addressed by reviving their old railway network. You don’t need to transport logs or steel or t-shirts at 350km/h, 50km/h will do. You can do both actually Kiashu: have high speed rail AND buses, cycling paths and so on. Second thing, if you have high speed rail, you can have higher speed freight. France does and I am sure many others do. To exemplify my point of view, I publish tomorrow an article on Spain. The thing with high speed train is that it is super convenient and clean, something everyone can use, no ? Algae is renewable, does not affect the food channel and consumes CO2. Algae is one solution to help get the US off foreign oil, crete new green jobs and become energy independent. To learn more about the fast-track commercialization of the algae production industry, you may want to check out the National Algae Association.